Last night I went with my bff, Katie, to a wine walk. A wine walk is basically a wine tasting, with different tasting stations around an outdoor shopping area. I found about it through groupon. I was able to get two tickets for the price of one and the proceeds go to New Vista Community, a charity in Vegas. Please ignore the wine stains, it happens. If it says there is going to be food, don’t believe them! There was one lil food station, that gave one mini taco. Luckily Katie didn’t want hers, so I had two. I planned on eating dinner there. BIG MISTAKE. Eat a meal before you go. It will stop you from being the tipsy/drunk girl who talks a lil louder than appropriate. HYDRATE. I drank water and gatorade all day to be prepared for the alcohol dehydration. Also, bring a bottle of water with you. An event may even have a water sponsor, but when you get to their booth, they may be out, which leaves you (the tipsy/drunk girl) waterless. Prioritize what wines you want to drink. This wine walk didn’t allow for seconds, so you had to keep trying new ones. There were decent sized lines and it hard to figure out which wine was what. Luckily Katie and I figured out the order and skipped ones we weren’t that interested in. You don’t have to finish every serving. I think this is what caused my tipsiness. Instead of using the containers to dump out what I didn’t finish from a tasting, I would just drink it. They were 1 oz. servings, but that adds up, especially for this lightweight. Katie did much better than me, I think she only had two full servings and took one sip from the rest. Smart DD that she is (she also ate beforehand). Pick up your favorite drunk food on the way home. Since there was barely any food there, we stopped at Wendy’s on the way home. I definitely needed that to sober up (and Wendy’s chicken nuggies are the BEST). Sober up at your friends house with a big glass of water (and a lil bit of time) before you drive yourself home (this is IMPORTANT, no drunk driving around here!). Come up with your no hangover cure. With wine, I’m usually guaranteed a hangover, I started to feel the headache coming on before I even got in bed. My hangover cure includes: 2 tylenol, lots of water and 1 tums. I woke up this morning feeling super refreshed. It didn’t hurt that I was in bed before midnight and slept til 9. Most importantly: HAVE FUN. 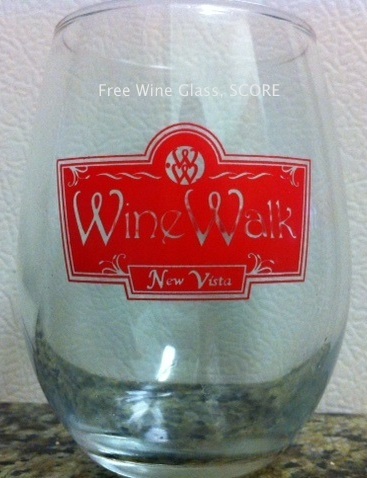 The wine walk was fun, it was in a cute Italian village located on Lake Las Vegas. There is another one October 1st if you live in Vegas and want to check it out you should! In other news, how about them GAMECOCKS? The first half wasn’t pretty (OMG turnovers!) but it picked up in the 2nd half. Hopefully we pick up our game because next week we face Georgia. Hope you’re all having a great labor day weekend! Have you ever been to a wine walk or big wine tasting? If so, how did you manage? I’ve never been to a wine tasting! That sounds fun…and I’m glad you weren’t feeling hungover this morning! It is a lot of fun, I bet there are a bunch in boston. You should check one out, or fly to vegas in October and we can go to the one on Oct 1!